All right, now this is awesome! First off there is some crossover within the DCU which was lacking with Vol. 4. Here we start with a Zero Year issue and have a cameo by Batman and further on in the main story Katana shows up and joins in the battle. 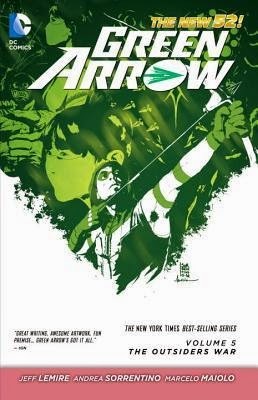 After the Zero Year, we go back to the main story and most of the volume takes the story arc about the various Outsider clans, along with story of Oliver's dad and brings it to a conclusion. A very gritty, satisfying storyline. Then the remaining issue goes back to the Richard Dragon/Clock King underworld story which has been lightly running though Lemire's plot so far and brings it to a cliffhanger ending as we meet all the villains in Dragon's gang. Excitingly good stuff! !